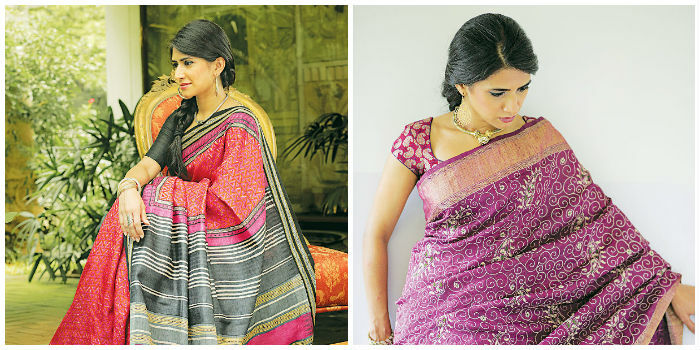 A revivalist of handloom textiles, Arundhati Menon knows her saris. More than three decades ago, when she started Shilpi, the sari and ethnic wear boutique, she knew exactly what her clientele wanted, and showcased unusual weaves by craftsmen who were rarely patronised. Since then, a lot of designers have joined the movement to promote traditional textiles, and Menon herself has moved on from Shilpi. Now retailing her own brand at Samasta, a boutique started by her daughter, Mridulika Menon Madiraju, Menon says, a�?Letting go of Shilpi was emotional, but it was also a relief. It was like bringing up a daughter and finding her a groom who would value her. But I no longer wanted to take care of the administrative part of things.a�? The move gave her time for other pleasures in life like a�?spending time with my familya��my husband, daughters and grand daughter.a�? Menona��s new range of saris are named a�?Abhaa�� after her mother. a�?This brand is a tribute to my parents,a�? 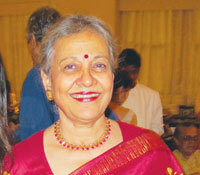 Menon says, admitting that her mother is the reason she fell in love with textiles and handloom saris. a�?At a time when mill-made saris were popular, she wore only Bengal handloom saris and Tangails. So when Ia��d wear them to college, I stood out and girls asked me if I could get them saris from Bengal. Thata��s how Shilpi was born,a�? she shares. Inspired by nature, Menon has used mango, leaf and lotus motifs in her first collection. a�?And since we are a country of colours, I have bright pinks, yellows, greens, turquoise and blue,a�? she says. As for the fabrics, it is khicha silk, tussar silk and matka silk, for now. Welcome back, Arundhati. Priced at Rs 4,500 onwards, Abha is available at Samasta, Alwarpet. Details: 42721110.